"Child Neurology" is a medical journal devoted to pediatric and adolescent neurology. Papers from the fields of pediatric neurosurgery, childhood and adolescent psychiatry, psycho-pedagogical and from all aspects of rehabilitation are also published. Papers from other medical fields are accepted if they bear relevance to children and adolescence neurology. The journal publishes original papers, review papers, case reports and short communications in English (preferably) and in Polish. In the justified cases the Editors shall help with the translation into English. Separate sections of this journal are: Letters to the Editor, Abstracts of international important papers, Book Reviews, bibliography of Polish literature concerning pediatric neurology, information about the activities of the Polish Society of Child Neurologists and of its regional branches, as well as reports from the meetings and scientific conferences. Letters to the Editor should substantially correspond with the previously published materials. The manuscript should be submitted only electronically via the "Editorial Panel" located on the website of "Child Neurology" (www. 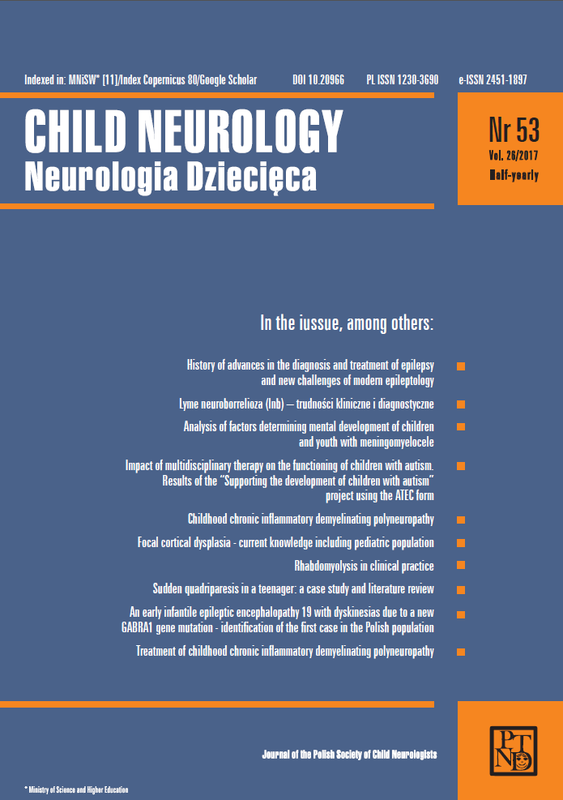 child-neurology.eu) or by e-mail: neurdziec ump.edu.pl. Any questions should also be sent to this address. Authors can check editorial progress in the "Editorial Panel." The volume of original and review papers should not exceed 20 pages of the standard typescript (1 page 30-32 lines, margin 2,5 cm) including figures and tables, bibliography and supplements. The text should not be formatted. The text of the manuscript should be written in the Microsoft Word format with the extension *.doc. Case reports should not exceed 8 pages, letters to the editor, reports and book reviews should not exceed 3 pages. In justified cases the Editor reserves the right to publish longer papers. the first author's address should be put, including a valid email address. papers in English by Polish authors must contain the title, abstract and key words in the Polish language. Note: The order of placing the titles, abstracts and keywords is determined by the language in which the paper is published. If this is for example English, then English has priority. Introduction and aim of the paper: Introduction should be as concise as possible and introduce the context of the paper to the reader; the paper should clearly state the research hypothesis and the aim of the study. Material and methods: Description of the studied population or material should be detailed and contain all the necessary information to assess the reliability of the results and to allow the experiment to be repeated by other researches. The section related to statistical analysis should include information on applied statistical tests and programs. Results: They should refer direct to the subject of the paper. It is advised to complete the text with tables and figures. Discussion: Authors own research findings should be compared with the findings previously published in the scientific literature. Conclusions: They should be concise, follow the results presented above and correspond to the aim of the study defined in the introduction. The authors of papers dealing with case descriptions are obliged to keep the personal data of the patients confidential. The editor shall keep the faces on the photographs but if is not advisable because of the substantial importance of the pictures, the author should obtain the patients written consent for publishing his/her image. During the reviewing process, the editor has the right to ask the author to present the permission for the presented research issued by the appropriate Bio-Ethic Committee. Ammache Z., Afifi A.K., Brown C.K., et al. : Childhood Guillain-Barre syndrome: clinical and electrophysiologic features predictive of outcome. J Child Neurol 2001; 16: 477-478. Bidziński J.: Guzy układu nerwowego. [in:] Neurologia kliniczna. Wald I., Członkowska A. [ed. ], PZWL, Warszawa 1987. Corballis S.B., Beale J.L. : The Psychology of Left and Right. Wiley and Sons, New York 1976. Tables should be marked with Roman numbers according to the order in which they appear in the paper, each should be placed on a separate page. Authors should indicate the position of tables in the paper and references to them, e. g. Tab. I. Title and the headings of the table should be written in Polish and in English in the Polish version of paper. Information included in the tables should not be repeated in the text. Explanations to the tables, e. g. full names of the abbreviations should be given in the footers under the table and marked in the order: "*", "**", "***" etc. Drawings, photographs, pictures, scans etc. should be marked with Arabic numbers according to the order in which they appear in the paper. They should be placed on a separate page, and in the electronic version  in separate files. Title of the drawings should be written in Polish and in English in the Polish version of paper. The position of the figures in the text should be indicated e. g. (Figure 1). To figures prepared by computer, for example, graphs, diagrams, etc., we recommend to attach the original files of the programs in which they were made. Figures should be saved in one of the following formats: .jpg, .bmp or .tif. Photographs sent to the editor in the electronic form should be of 300 dpi resolution and have file extensions *.tif or *.jpg. Please do not insert the drawings and the photographs in text of the article. The title and the explanations should be written in Polish and in English in the Polish version of paper. Figures and photographs are placed in the paper in the form delivered, so they must be prepared carefully. Their location in the text should be marked. If a figure (photograph) has been published, its source should be given, and a written consent from the copyright holder should be obtained. The authors name and the first words of the papers title should be written (preferably in pencil) on the reverse side of each figure in the traditional form (ie. the image plate, paper); the top of the figures should be marked (with an arrow). Abbreviations should be always explained when used for the first time in the text (including abstract). Unless in exceptional situations, abbreviations should not be used in the title of the paper. In special cases, the editors may request the author to supply illustrative material of sufficient quality on CD / DVD or via the Publisher's ftp server. the head of the institution acceptance. Abstracts of foreign papers / Whats new in pediatric neurology? : Should not exceed 2 pages of so called standardized typescript. The initials and names of authors, title of the paper in Polish (and foreign), the original title of the magazine - year, volume, issue and pages-from-to should be given. Book review should not exceed 3 pages of so called standardized typescript; please give the name and surname of the author (s), title, publisher, year of publication, number of pages. Similarly, using the above rules, we point out that every case of adding to the list of authors persons whose contribution to the paper was none or negligible, will be made public on the website of the magazine. Negligible share is, for example, to merely make available the results of diagnostic tests, their descriptions, consultation of the results, etc. In each case the Editor reserves the right to request a written statement of the first author as to the true, specified in % contribution of individual authors in the publication. Editors of "Child Neurology" abide by the global principles of scientific integrity and honesty, which means that if the work was in part or entirely funded from external sources, the author is required to submit an appropriate statement containing the list of financing entities together with a declaration in which is stated the absence of financial dependency, of influencing or attempts to influence the outcome of the research. All papers are evaluated by independent reviewers, preserving the anonymity of both the authors and the reviewers. The editors reserve the right to correct stylistic errors and the designations as well as to make the necessary abbreviations without arranging it with the author. The Editors reserve the right to reject the paper without the reviewers opinion if  according to the Editors Panel  the content of the paper does not meet minimum acceptance criteria or if the subject of the paper is beyond the aims and scope of the journal. Each author of the paper bears responsibility for the reliability and completeness of the data presented. If there are more than four authors, the contribution of each of them should be described in a cover letter. Papers presenting results of clinical research concerning pharmacological agents and medical procedures should meet the requirements published by CONSORT group (Moher D. et al. Ann Intern Med 2001, 134: 657-662). The authors are expected to provide an extensive description of the manner of funding the studies and the role of the sponsor in planning, realizing and analyzing the results as well as the influence of the sponsoring institution on the content of the article. Observational meta-analysis of epidemiological studies should be prepared on the basis of recommendations of MOOSE group (Stroup D.F. et al. JAMA 2000, 28: 2008-2012). Recommendations of QUORUM group should be used while preparing meta-analysis of studies with randomization (Moher D. et al Lancet 1999, 354: 1896-1900). Indications concerning preparation of papers on the accuracy of diagnostic tests are included in STARD (Bossuyt P.M. et al. Clin Chem 2003, 49: 7-18). Upon the acceptance of a paper the Editors take over the copyright. In case a paper is not accepted for print, the submitted materials will not be returned to the author. Authors are obliged to submit corrections within a week from the date of receiving the so called brush-printing. The owner of the journal, the Polish Society of Children Neurologists, acquires exclusive copyrights to the printed papers. It is allowed to print abstracts without the Publishers consent. The Editors address: Katedra i Klinika Neurologii Wieku Rozwojowego Uniwersytet Medyczny im. Karola Marcinkowskiego w Poznaniu ul. Przybyszewskiego 49, 60-355 Poznań. Tel. +48 61 869 12 55, fax +48 61 869 15 53. A Polish Instructions for Authors is available on the website of "Child Neurology".